Cas di Das is a brand new, fresh and perfectly located house. All the rooms are airconditioned and the kitchen has all the appliences you need. The large pool is suitable for chilling, as well as swimming. Cas di Das is located very near the most beautifull beaches of the island (2km) and the best restaurants in the High Rise area. Within 3 minutes you're at Superfood, the biggest grocery store of the Island. Hello, my name is Jeroen. I am a Dutch Navy Officer and living, together with my girlfriend, in Aruba for 2 years now. We have started the build of this beautifull house last year, and finished it april 2018. After one holiday in Aruba, we knew we wanted to live here. Because we couldn't find the perfect house, we've build it. For now we live in a rental house so other people can enjoy our house. After my tour is over, we want to live in it ourselfs. The house has a very large pool, a perfect location and is brand new. Induction cooking plate. Cooks like on gas. 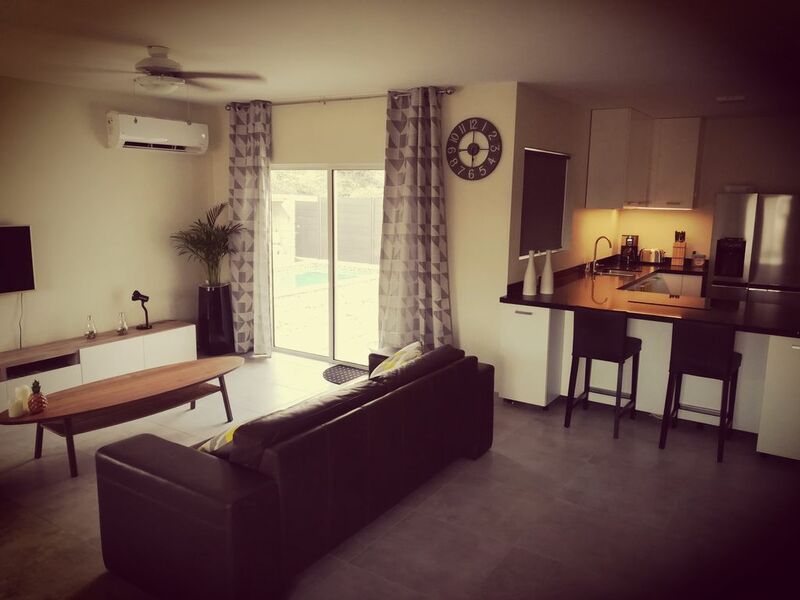 Large Private pool (28m2), with chilling and kids area. What a GREAT house, owners are super friendly. We enjoyed the pool and the outdoor living room. The pans were great, plenty of dishes and silverware. Loved the kitchen and the ice and water in the door. Thank you for a wonderful place to stay. Wife and I had a wonderful time here Jeroen the owner did a fantastic job with this place from the pool to the appliances and furnishings!.7 minutes from beach best to drive plenty of beautiful beaches close to all restaurants .tradewinds are always blowing at least 20 miles an hour makes it very comfortable to be outside ..No problem with bugs. We have done 38 island trips and I’d say there is at the top of our list. Brand new house with pool, very nice garden, extremely clean and comfortable! Excellent location, 2 minutes drive to SuperFood and 5 min drive to one of the best beach in the world. Host is very responsive, outstanding customer service, highly recomended! The house was great. Everything is new, neat, & clean. The location is central to everything that we wanted to do. There were Tommy Bahama beach chairs, a cooler, & beach umbrellas for our use which was nice. We enjoyed the backyard pool & patio everyday! Jeroen was a great host! This house is in an excellent location. It has plenty of room for 5 people. The owners have thought of every necessity and are quick to answer any questions or concerns.